Reader of this blog and friend Darrel Kennedy, Assiniboine Herald at the Canadian Heraldic Authority, sent me some photos from a book, China for the West by David Howard and John Ayers, which shed some more light on that plate and the history of the set to which it originally belonged. 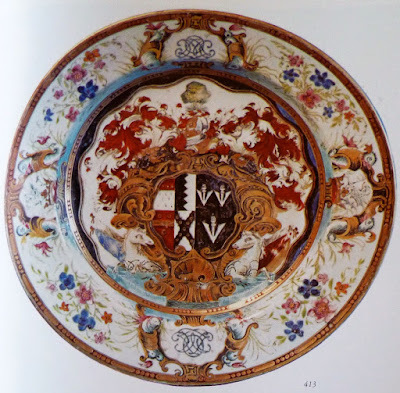 Magnificently enamelled in a wide rage of famille rose colours copying minutely a coloured painting sent to China (413a) [immediately below]. There is no trace of Chinese design in this service and every stroke, down to the bends in the blades of the water reeds, is a faithful mirror of the original. There are two variations from the pattern: first, the original was painted on a dull buff background (almost as if the local(?) 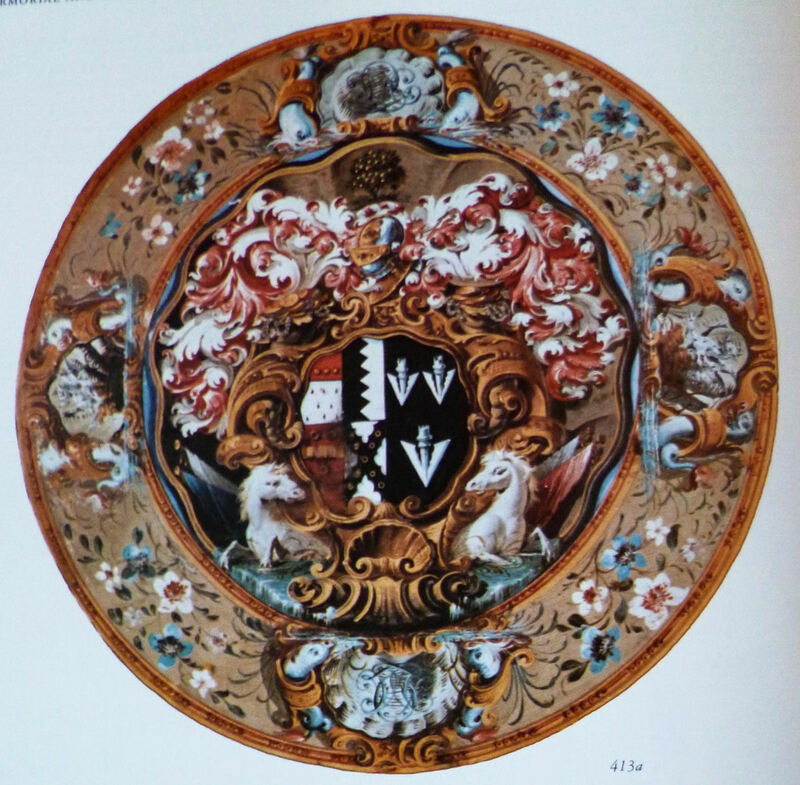 painter did not know of the white porcelain that was then flowing into Europe), and secondly, the scalloped effect of the whole central ground, which is shown clearly on the pattern, has not been translated on to the plate. These two differences apart, the reproduction is exceptionally accurate and marks out this service as one of the finest ever made. The provenance and documentary evidence are scarcely less interesting. The quarterly arms are of Leake Okeover, born 1702, and impale those of his wife Mary Nichol whom he married in about 1730. On the rim are four reserves with his crest and their cypher L.M.O. It must have been in 1738 that he first ordered a service of porcelain from China, sending a painted pattern with the words on the reverse The Arms of Leake Okeover Esqre. of Okeover near Ashbourn in the Peak in the County of Derbyshire - a pattern for China plate. Pattern to be returned. In 1740 and 1743 two deliveries were made (see 413b) [immediately below]. 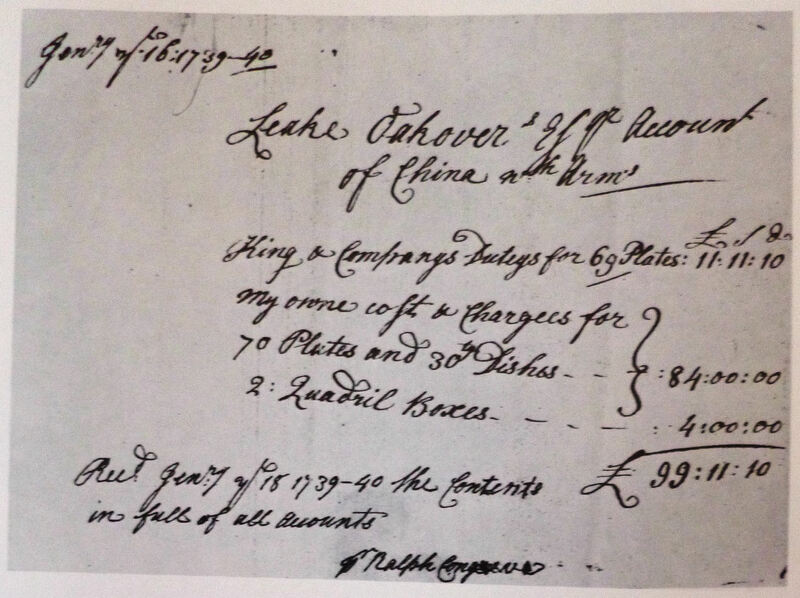 The first is dated 16 January 1740, listing "70 Plates and 30 Dishes", which with duties and boxes cost £99 11s. 10d, and signed Ralph Congreve. The second is dated 1743, rreading "from ye Jerusalem Coffee House, Change Alley, a consignment of fifty plates and four large dishes with your arms". It is addressed to "Leake Okeover Esqre." by Joseph Congreve, Commander of the Ship Prislowe. Thus a total of not less than 120 plates and 34 dishes were delivered but, as far as is known, no piece of another shape. The price of £1 each reflects their very high quality and may be compared with the prices of the two services delivered to Charles Peers a decade earlier. Leake Okeover died in 1765 without an heir, but the estates, as well as these documents, are still in the possession of his family. Over the years a very small number of plates have left the family [including, I have to assume, the two I saw in the National Gallery in Washington] and in March 1966 a perfect specimen was sold at auction for the then surprising price of 580 guineas [a guinea is one pound one shilling, or in decimal currency £1.05. 580 guineas would be £609, or US$741.88 at the current exchange rate. In any case, it's a lot of money to spend for a single plate]. In March 1975 a hundred pieces, dishes and plates, of which more than half had some damage, were sold by Sir Ian Walker-Okeover Bt for almost 58,000 guineas [£60,900 or US$74,336.71], thus confirming an appreciation in value of at least six hundred times over the two hundred and forty years (although the currency is probably worth about one sixtieth of what it then was). Fortunately, the care with which this service was designed and then painted in China is matched by the care with which it has been treated since. Thus much from China for the West. It's a great supplement to the information I was previously able to find out about these plates two years ago, and I have to thank Darrel for remembering my original post and for sending me this additional information that I can now share with all of you.